I, Sheran, had been doing hand and flatbed machine knitting for many years when, at Merrimac Knit Club I met Deb Oswald. Deb talked about buying a number of circular sock knitting machines and I had to have one! We bought a restored Gearhart from Debbie and her husband Pete and, after walking around it for many months, I finally tried it out. Well, I since have been to 2 seminars and have bought a video how-to tape and finally can make socks! We got involved in helping to set up a little musuem that had several late 1880's scenes. We worked on the blacksmith scene and the domestic scene. 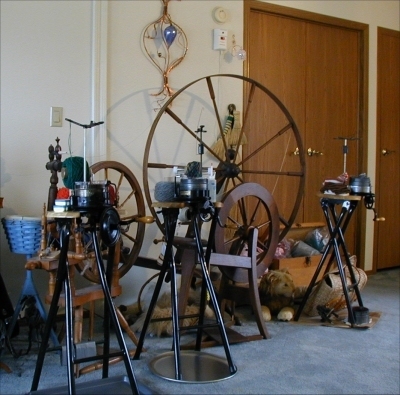 The domestic scene needed spinning wheel work and CSM work. That got us a deeper understanding of the CSM in general. Again, we got a lot of support from Deb and Pete Oswald to help us pull that one off! Since then, I have landed 2 more csm's, a Gearhart and a Creelman Bros. They are right outside my bedroom door, so every now and then I stop right there and crank out another pair of socks. A last comment: If you use a circular sock machine, you probably know how much oiling they take. For a long time, my machines had pieces of cardboard under them to catch the drips. Just recently, we bought a cookie sheet and a pizza pan to put under them instead. They worked out just fine. This is a Yarn Stand Top for Auto-knitter, Creelman and others. We have made them as an EXACT replacement for the cast iron or pot metal tops that break and/or are missing when you buy a used machine. If you simply want to get your machine going and don't care about historical accuracy, there are other ways to get the job done. These yarn stand tops are for those who want their machines to look "just like the original". We only started doing this because we needed one for the museum and one for my Creelman. These are all made from one piece of laser-cut 5/16" thick mild steel and then machined, ground, shaped and painted wrought iron black. Being made of mild steel, they won't break when dropped, as the old cast ones did. It comes with the two screws and the brake. 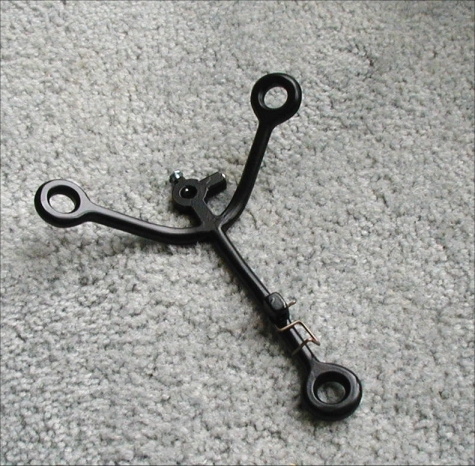 You supply the heel spring. In the past, we have made them using several different methods, but they all are exactly the same style. We wanted to be able to make them to sell for about $40, but no matter what we have done, we can't get the cost down that low. This last "run" was of 12 pieces and, as of this date (June, 2010), none are left. This one sells for $56 plus 4.95 S&H. We never planned to make them again. They either take a too much labor or the cost of parts is too high. One lady told me that she had a "guy" who could finish a blank for her if I would sell her one. I sent her some info on what was required to get the job done, and I never heard from her again. If you have any questions, you can email us or call us at 715-698-2895. I, Pete, (Sheri's husband) am currently out of stock on the Yarn Stand Tops. We only get about one request a year, so it's hard to set aside 50 hours or so to make a dozen up. If you are in no rush to get one, you can email us with a request and, if we get 3 or 4 as a backlog, I will make another run.